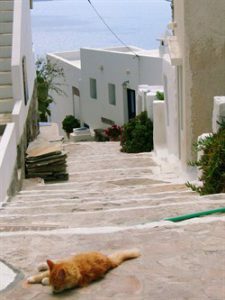 Milos Plaka, as previously mentioned, is the capital of the island. It began to develop dramatically after the destruction of Ancient Hora when Castro was no longer able to accommodate the increasing numbers of refugees within its walls. 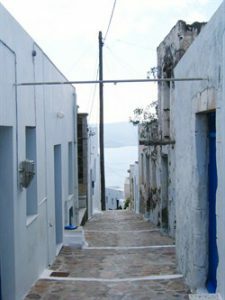 The village, so called because of the flat land on which it was built, is notable for its island architecture, mild climate and wonderful views of the Gulf of Milos.Walking along the narrow back streets between neat white-washed courtyards and balconies festooned with flowers, we are filled with feelings of familiarity and warmth. 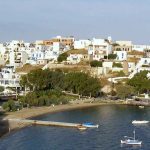 In Milos Plaka traditional village, are most of the civil service offices and the folk and archaeological museums - custodians of cultural heritage from the distant to the more recent past. Also, the churches which, by their very existence, remind us of the history of this volcanic hill from the time of its first settlement until today. The area on the summit of the hill is called Castro. It is no longer inhabited but its rich history began after the destruction of the ancient city of Klima between the 5th and 6th centuries A.D. The Kimisi of Theotokou (Assumption of the Virgin) or Mesa Panagia, is the church on the summit of the hill of Castro. On our left, as we descend the path towards Plaka, is the remarkably beautiful church of the Ipapanti of Christ (the Circumcision of Christ) or Thalassitra, which had been a very small old church until the end of the 18th century. It could not however, fulfil the needs of its congregation and so it was decided to build a bigger and more impressive church which was realised in 1839. Castro has another great advantage. 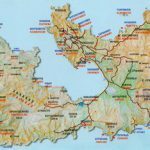 It offers amazing panoramic views and on a clear day, we are not only able to see most of the island but other Aegean islands too as if we are looking down from an aeroplane. From this point too we can enjoy a magical sunset ... a sight which will always remain in our memories as part of the colour of Milos. Our tour continues with a visit to the Church of the Genesis of the Virgin or Korfiatissa, which stands on the edge of a sheer cliff in the western part of the village and has a breathtaking view across the Gulf. It was built about 1810 or soon after, by the municipality of Milos with support from the local people. Near Korfiatissa is the Catholic church of Panagia of Rodon (the Virgin of the Roses), witness to the existence of the Catholic faith on the island since the age of Venetian rule. Louis Brest built the church in 1823, a fact which is confirmed by a French epigraph over the entrance, and a marble slab engraved with the legend «Louis Brest 1789- 1862» marks his burial place. The Folk Museum stands at the edge of the courtyard of Korfiatissa. Walking through the twisting, narrow streets, between whitewashed houses, we come upon a large, imposing building. Constructed at the beginning of the 20th century, it used to house the civil service offices, but in 1985, it was renovated and now houses the Archaeological Museum, where we can admire artifacts which reflect the entire history of Milos.